Also called Ben Scardaun. See Máire MacNeill, 'The Festival of Lughnasa' (pp. 182-83) for details of the festive assembly on the mountain. The name Boleybrack marked south of the summit belongs to a townland. Lackagh Mountain is the 734th highest place in Ireland. 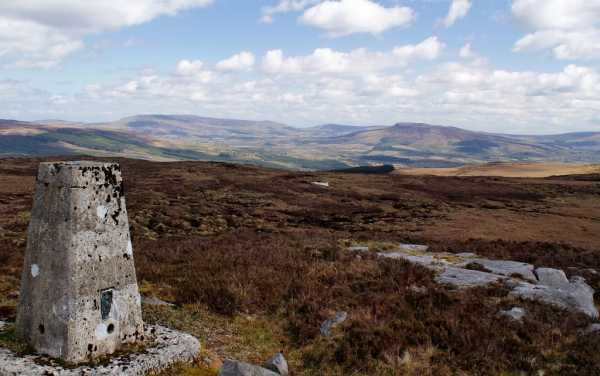 Lackagh Mountain is the most southerly summit in the Dartry Mountains area. Started from old forestry entrance (006304 A). This may seem distant but it was useful in completing a full and arduous circuit of the plateau above Glenfarne. Road is followed SW and in May it had primroses and flowering hedgerows, with views across the river Shannon to the precipitious flanks of Playbank. The well signed Leitrim Way was met at 986289 B and pleasant walking continued through stands of forest, past pools teaming with tadpoles and calves frolicking in fields. Just past the post office (971298 C) can continue with Lietrim Way or take the road left which climbed higher and gave better views. Reach a double set of forestry gates with plenty of room for parking if wanted to start from here. There is a spectacular waterfall and bridge over the river - followed the river uphill beside a narrow ravine with native trees in contrast to the uniform ranks of conifers. Soon left trees behind and easy going towards the summit area ahead. Mature heather appeared and past a stone enclosure and square blocks of stone before the summit area. The trig pillar stands on a rocky rise overlooking the bleached rock ringing beautiful Lough Strand - an oasis amongst the bleakness. Reached in just over 2 hours and views were certainly worth it. W to Truskmore, Teivebuan, Castelgal Hills, Ox Mtns and Atlantic, S & E over Lough Allen to Playbank and Cuilcaigh and N to mountains of Donegal. It was surreal clattering over the slates of rock around Lough Strand as a northerly breeze lapped water at its edge. The sun came and went on my face as i enjoyed the tranquility and beauty of this place. Several more hours of walking lay ahead for me to take in Ballaghnabahy Top and Naweeloge.